William Offwood Howell, patriarch of our branch of the Howell family in Australia, arrived in Melbourne as a 12 year old on 24 December 1852. Together with his mother Jane (27), stepfather Ephraim (25) and siblings Georgiana (10) and Henry (3) he left the town of Thetford, Norfolk, UK, in August 1852. 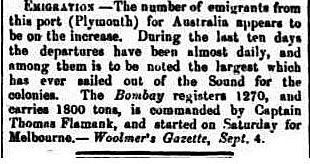 The family boarded the Frigate Bombay in Plymouth on 29 August, along with a complement of 706 assisted migrants and set sail on the four month journey to Australia. Like many other migrants of the era, the Howell family was leaving miserable times in Victorian England and looking to new possibilities of a better life in far off Australia (Appendix 1). Ephraim had earlier spent at least a year in Australia having arrived in 1848 aboard the sailing ship Cornwall. 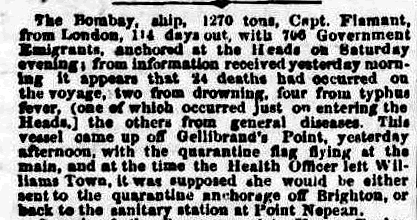 "The Cornwall arrived on the 11th, with 331immigrants from London and Plymouth; the only deaths on the passage were three infants. The Cornwall brought English news to the 27th April, but the intelligence given in the Melbourne papers is neither so late nor so complete as was received here by the Fairlie." Ephraim had earlier spent at least a year in Australia having arrived in 1848 aboard the sailing ship Cornwall. He worked as a shepherd along the Hume (now Murray) River somewhere in NSW. He was employed on a 12 month contract which paid ₤12 plus rations per year. It appears that Ephraim had met female servant Jane Green and her two children (William and Georgiana) whilst she and the children were inmates at the St Mary Union Workhouse in Thetford. The couple had fallen into a relationship prior to Ephraim's initial migration to Australia. Jane was probably in the early stages of pregnancy with Henry when Ephraim left on 28 April 1848. He subsequently returned to Thetford and married Jane on 7 April 1852. They were both illiterate and signed their marriage vows with a 'mark' (Appendix 2). Jane's three children took on the Howell surname (previously Green) following the marriage. Jane was just 14 when she fell pregnant with William. She was born in Hepworth, Suffolk, in 1824, daughter of John (43) and Mary (48) Green. At the time of the 1841 Census, Jane (15) was living with 55 year old shoemaker, John Llewellyn Lew Offwood, as his 'female servant', together with her baby, William Offwood Green (1) (Appendix 3). In 1842 her daughter, Georgiana, was born. The birth certificate for William (Appendix 4) does not identify his father. Suspicion is that Lew Offwood was the father of both William Offwood Green and Georgiana Green, however there is no primary evidence to support or deny this thesis. The fact that William was given 'Offwood' as his second name and his later use of the name 'Llewellyn Offwood' for his eldest son is suggestive of a close relationship. If Offwood was not the father, who was? An analysis of events suggests Ephraim Howell was the father of only Henry (born 1849), however no birth details have been found for Henry. The 1851 Census records Jane and her three children as inmates of the St Mary Union Workhouse in Thetford. They are all listed as 'paupers' (Appendix 5). Further investigation has revealed that Jane was employed as a female servant; baby Henry was with her. The older children, William and Georgiana, were students and accommodated separately in the single male and female quarters as was the norm. Children were allowed access to their parents for only an hour or two on Sundays (Appendix 6). Death records confirm John Lew Offwood died in December 1844 which could account for Jane's dire circumstances and her ultimate move to the Workhouse. Workhouses were under the control of the Anglican parish church and provided accommodation strictly to those in the most desperate financial circumstances. Novelist Charles Dickens has recorded much of life in the Workhouse eg. Oliver Twist (1837). 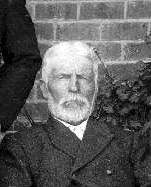 Ephraim Howell, born in 1825, was the son of James Howell and Mary Clarkson; they married in January 1821. As earlier recorded, Ephraim spent time working in Australia from 1848. His brother George (25) married Bathsheba Sheppard at Thetford in 1849; they migrated to Australia in May 1850 aboard sailing ship Sir Robert Sale. 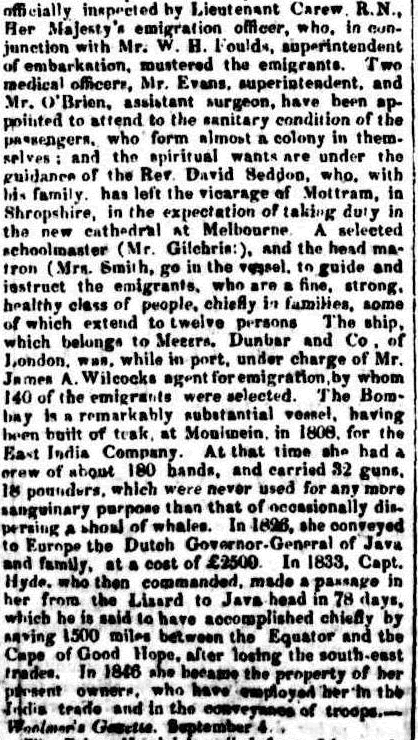 They settled in the Melbourne bayside suburb of Brighton and raised a family of 11 children (Appendix 7 & 16). It is probable that Ephraim had contact with this family whilst in Australia. 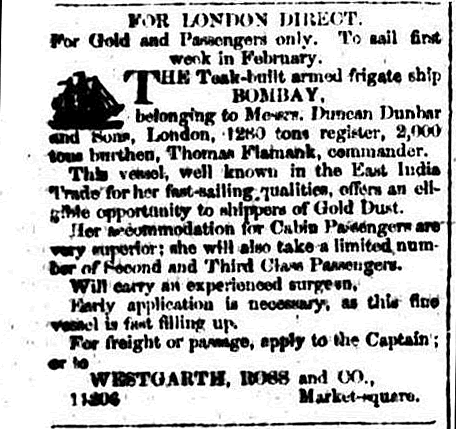 No doubt the Howell family was full of hope for the future when they boarded the frigate Bombay in August 1852. 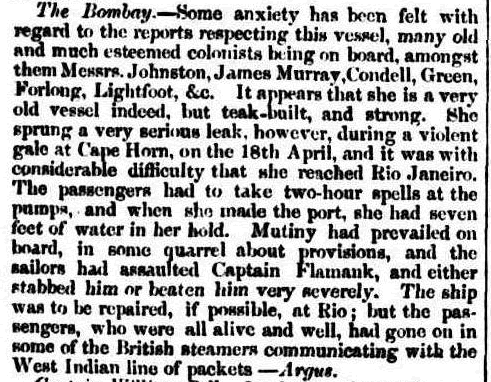 'The Voyage of Frigate Bombay' is recorded at Appendix 8: a compilation of two diary accounts of a dramatic four month voyage. En-route typhoid fever broke out. Ephraim was hospitalised with the fever on 9 October and died on 29 October; he was buried at sea (Appendix 8, p5 & 7). This tragic event must have devastated Jane and the children. She had endured such an impossibly difficult life to this time and now with new hope on the horizon, all was dashed; a bitter blow! But she was a survivor. 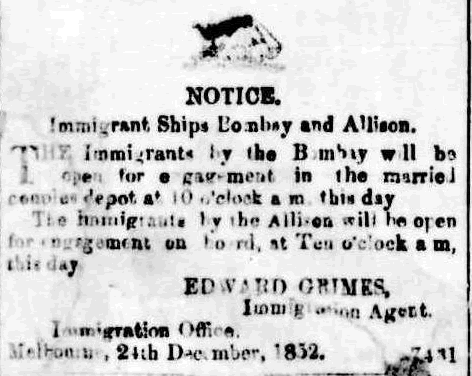 The Bombay sailed into Port Phillip Bay on 11 December 1852 and finally berthed in Melbourne on 24 December following clearance from quarantine for the typhoid outbreak. Jane, William, Georgiana and Henry Howell set foot on Australian soil to a very uncertain future. Ephraim's brother George and family were probably on the wharf to greet them and offer support. Life for Jane Howell and her children during the first year or two in Australia is unknown. Circumstances suggest they were connected with George Howell's (Ephraim's brother) family in Brighton during this difficult poverty stricken time. George is recorded as working a farm on Richmond Hill, at the edge of central Melbourne, in the Electoral Roll of 1856. William Howell, said to be a rebellious teenager, is next recorded on the Pyrenees goldfields at Amphitheatre in 1855 (height of the Gold Rush) with butcher, George Pinch. Pinch had arrived in Australia in 1854 from Cornwell as a 31 year old migrant. He somehow met the Howell family and took young William (15) under his supervision, maybe as an apprentice. George Pinch is a most critical individual in the unfolding Howell story. Family legend has it that Pinch and William Howell arrived in Amphitheatre aboard a wagon from Melbourne and set up a butchers shop to service the thousands of miners then active on the nearby goldfields. They ultimately established a chain of butchers shops across the Pyrenees goldfields: Amphitheatre, Elmhurst, Avoca (2) and Percydale (known earlier as Fiddlers Creek). They built their shop in Amphitheatre in 1866. William's younger brother, Henry (16), joined the operation at Percydale in the mid-1860's. There are records of him acquiring property in Avoca in 1869 and shares in a gold mine in 1873. What became of their mother Jane and sister Georgiana is unknown. It is possible they both accompanied Henry to Percydale and assisted in the business, maybe stayed in Melbourne or returned to England. An extensive search of archival records (electoral rolls, outward shipping records, deaths and marriages for Victoria and South Australia) has failed to account for either Jane or Georgiana following their arrival in Australia. Family legend suggests Georgiana was fostered to another family and may have taken their surname. One of Henry Howell's descendents, Lance Matthews (great uncle of Peter Richards), believes Georgiana was abducted from school in Melbourne in the mid-1850's and was never seen again. However, a careful search of Missing Persons, Adoptions and Inquests records for that era, held by the Victorian Public Records Office and Melbourne Public Library, has failed to confirm either the adoption or abduction assertions for Georgiana. Whatever occurred, Jane and Georgiana now appear lost to history. Henry Howell (28) married Edith Butler (18) in March 1878 and set up a butchers shop at Allendale, near Mt Gambier, in SA. Henry died in 1919 and is buried in the Mt Gambier Cemetery (Appendix 9). Henry and Edith had nine children: Annie, Edith, George, Arthur, Alice, William, Emily, Grace, Doris, Ellen and Elsie (Appendix 17). Jane may have followed them to Allendale but there is no record of this. The families of William and Henry lost contact and have only recently reconnected through this current family history research. Following his successful butchering enterprise, George Pinch used his considerable wealth to buy extensive tracts of excellent farmland along the Avoca River valley, some 5km from Amphitheatre, towards Avoca, along the present Pyrenees Highway. He began a mixed farming operation. Around the late-1860s, he built a magnificent brick homestead on the property, known later as Thetford. at 6/6 and ewes in wool 12/6. 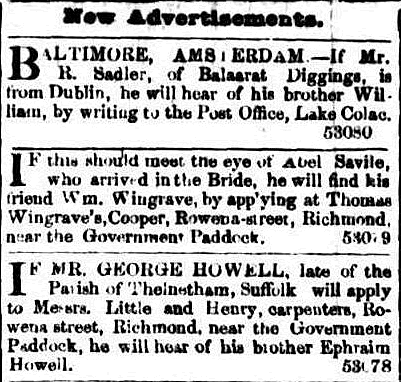 1867 March 2: drove to Ballarat with Wm Howell. May 16: W Kay built Pinch a stable for ₤14. July 25: sent black sow to Pinch's boor. August 23: Wm Howell killed pig, 188lbs. October 24: self, Pinch and Moore went to Ballarat Show. October 24: self, Pinch and Moore went to Ballarat Show. 1883 : Avoca Shire Elections: Wise 216, Pinch 212. 'Auctioneers' in the Avoca trade directory of the period). .
George Pinch was very active as a Councillor and Shire President for both the Lexton and Avoca Shires. His Obituary published in the Avoca Mail in 1910 (Appendix 10) details his numerous community activities, including his appointment as a Justice of the Peace in 1880. It appears that Pinch moved to Avoca, possibly in the late 1870's, and along with all his other activities began an auctioneer partnership with John Campbell (Pinch & Campbell). His term as an Avoca Shire councillor began in 1876. Pinch is recorded as living in Avoca in 1899, at the time of the Australian Federation referendum. He died in 1910 aged 87 under the care of the Williamson family in Avoca and is buried in the Amphitheatre Cemetery. His Death Certificate (Appendix 10) records him as a 'retired farmer'. Pinch's funeral on 5 April 1910 is recorded by Henry Bird as attracting a large crowd. Throughout both diaries there is no mention of Henry Howell or Jane Howell, suggesting Henry concentrated on the Percydale operation prior to moving to SA in the 1878. Had Jane ever lived in Amphitheatre she would surely have rated a mention in these two extensive diaries. William Howell was as a son to bachelor George Pinch and became very financially secure through his management of Pinch's butchers shop in Amphitheatre. It is evident from the 'Bird' diaries that William was active as a farmer and livestock trader as well as butcher. William (30) married Grace Elvins (23) in 1870. 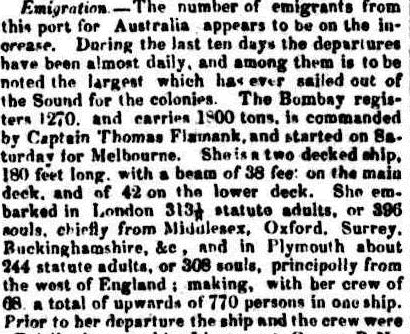 Grace had arrived from Cornwell as a 15 year old in May 1862, aboard the sailing ship, Monarch (Appendix 11). William and Grace raised seven children: Francis Elvins Fanny (1871-1943); Jeanie (1873-1919); Annie (1874- 1956); Llewellyn Offwood (1876-1932); George Pinch (1878-1940); Mabel (1879-1948); Grace (1885-1928). William named his first son Llewellyn Offwood Howell, presumably after Lew Offwood. George Pinch had earlier promised William his farming property on condition his son adopted the name Pinch. Accordingly, William's second son (my grandfather) was duly christened George Pinch Howell in 1878. It appears that the Pinch and Elvins families were well known to each other in Cornwell and probably inter-married. The year 1878 was a most significant milestone for the Howell family. The birth of George Pinch Howell triggered the somewhat bizarre arrangement for William Howell to inherit the Pinch farming property and homestead. George Pinch then apparently moved to Avoca to continue his many other interests and activities. Following William's inheritance of the property he named it 'Thetford' after his home town in Norfolk, UK. That same year Henry Howell married Edith Butler and moved to South Australia. Also, William purchased a 360 acre property, Prentices, for ₤2 per acre. One cannot help but wonder if all this activity was a happy coincidence or were there undercurrents of ill feeling between William, Henry and Pinch. The fact that William and Henry lost contact with each other and no Howell family members were involved with the Pinch funeral arrangements 22 years later, might suggest some relationship stress. We can now only ponder these family issues as there is no direct documentation to either support or negate them. William's second son, George Howell (21), ultimately took control of the Amphitheatre butchers shop from his father around 1899. Seven years after Graces' untimely death from pneumonia in 1907, at age 59, William (74) married 49 year old spinster, Eliza Lever, much to the chagrin of his family.Inheritance issues no doubt played a role in this family unrest; Eliza was little older than William's adult children. At the time of the wedding (1914), four of William's unmarried daughters, Jeanie (41), Annie (40), Mabel (35) and Grace (29), were living at home with him at Thetford (Fanny had earlier married Joseph Quayle in 1906). These four daughters would most likely have presented a confronting challenge to Eliza, their step-mother. Understandably, the newly-weds established a home in Avoca (Barnett St) from where William continued to operate the farm until his death in 1917, at age 78. He collapsed and died at Thetford under the care of his daughters and Dr Johnston.A Death Certificate, together with an obituary in the Avoca Mail, provides further details on William (Appendix 12). His private funeral arrangements at Amphitheatre are unusual given the wide respect he enjoyed in the community and perhaps reflect on-going family tensions. One of his daughters, rather than his wife, acknowledged the letter of condolence from the Shire of Lexton. Eliza is recorded on the Avoca Electoral Roll in 1924; she died in 1944. When George Howell inherited the Thetford property following his father's death in 1917 there would most likely have been some significant inheritance sharing with Eliza. Inheritance issues and the support needs of William's four unmarried daughters most likely contributed to the long delay in the property transfer to George. By 1919, two of his daughters had married (Grace to Jack Lusby, 1918, and Mabel to Jack Quayle, 1919); Jeanie died in 1919; Annie moved on and died in Hawthorn in 1956 at age 82. Following major refurbishment and extensions, George Howell and his family moved to Thetford in 1926, some nine years after William's death. Alex Studd then took over the butchers shop in Amphitheatre. William's son George, then 21, took over the butchers shop in Amphitheatre around 1899, some eight years prior to his marriage to Lillian Trethewie in 1907. George was 29 and Lillian 22 at the time of their marriage. 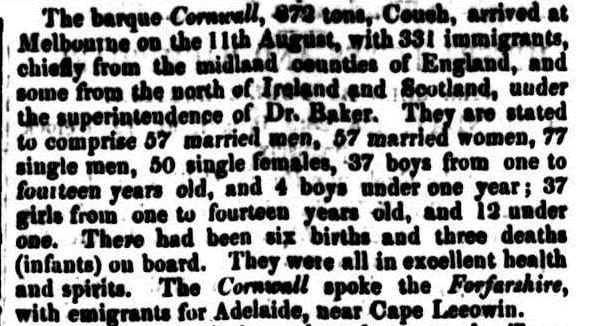 She was from a wealthy farming family at Everton (near Launceston), Tasmania (Appendix 13). It is clear from the Pinch obituary there was a long standing relationship between John Trethewie (Lillian's father) and George Pinch, probably dating back to a friendship in England. This association appears to have led to stud cattle dealings and the provision of tree seedlings. George Howell probably met Lillian during a visit to buy stud breeding cattle at her family's Everton farming property, 'Whistloca'. George and Lillian had five children: Errol George (1908-1990); my mother, Beatrice Elvins Elvie (1910-1973); Trevor William (1913-1952); my godmother, Joyce Emily Joy (1916-2003); Nancy Grace (1918). A photo gallery of the family is at Appendix 16 and a family tree at Appendix 17. George was very community spirited; he was elected as a councillor of the Lexton Shire and was Shire President in 1937. He died in his sleep at Thetford on 6 November 1940 at age 62. An obituary in the Avoca Mail of 8 November 1940 (Appendix 14) describes him as a "thorough gentleman --- . He took an active interest in all matters that were for the betterment of the district". A large crowd gathered at his funeral "bearing silent testimony to the esteem in which the deceased was held". Lillian died in Avoca in 1962. I was the youngest of a family of five, having two brothers and two sisters. My mother was Lillian Beatrice Trethewie before she met and subsequently married my father George Pinch Howell. (I shall tell you later how he acquired his middle name). My mother was brought up on a property called 'Whistloca' near Everton, Tasmania. She was one of quite a large family, her brothers were Arthur and Roy and her sisters were Emily, Ruby, Effie and Vera. The girls all went to Methodist Ladies College in Launceston and the boys went to school at Launceston Grammar. My mother became a music teacher at Methodist Ladies College when she had finished her education. She was a wonderful musician and could play any request on the piano. She also played the viola, which I still have. She was also a top organist and played the organ in the Amphitheatre Church for 25 years. She also taught Sunday school and trained children for the most wonderful anniversaries. Dad met her when he went over from the mainland to Tasmania to buy cattle. He was at that time a butcher. My mother must have wondered what she had struck when she came to Amphitheatre. She had come from a large home and her parents were wealthy. Grandma Trethewie was a very straight laced person, very much the lady. She was always chauffeur driven and her chauffeurs name was Joe. All the family were terrific riders and rode in the Launceston show, always in the correct attire. My mother won quite a few prizes on her beautiful horse. Her horse's name was Kitty, and I had good reason to remember her as she ran right over the top of me, her foot landing in my groin. I had that scar for many years. My earliest memories are from the age of four being carried to school on a Friday afternoon on my eldest brothers (who I thought was wonderful) shoulders where he would proudly show me off to all and sundry and leave me in the infants room of the Amphitheatre State School, where Miss Annie Mill taught all grades up to grade 4. I started school when I was four and a half. My father ran the butcher shop at the time which was only a few minutes from the school. Directly across the road from us lived old Granny Spiers, Miss Clara and Uncle Fred (no relation to us). Granny was always dressed completely in black, including a black bonnet. She sat on a wrought iron chair at the front of the house and told us stories of Henny Penny and Foxy Loxy, which we lapped up. At this stage I must say that the general population of Amphitheatre were very poor, their parents having flocked there in the mining days, and with the gold rush over most depended on small fruit orchards and grew their own food. My mother was always handing food out to the needy. There were five children in our family, Errol was the eldest then Elvie, Trevor, Joy and I. When I was eight my father was left the farm called 'Thetford' (where Howell's still live now) by a Mr. Pinch who had been my grandfather's partner and was quite wealthy. Mr. Pinch had never married so had no son and my father was always his favourite. The condition was that my dad took the name of Pinch, as his second name. My father had one brother, Llewellyn and his sisters were Mabel, Grace, Jean, Fanny and Annie. Mabel married John Quayle and they lived in the brick house just past the Amphitheatre cemetery. (where Rod and Helen Lusby now live). Mabel was plump and deaf and had no family. Lew (as he was known) married a city girl, Sophie, and they lived where John and Isabel Lusby now live. They had two children, Allan and Margaret. Sophie hated the country (she was very uppity and didn't mix) so they moved to Melbourne, where Uncle Lew made a fortune on the stock exchange. Amphitheatre was quite a poor district in those days, the gold rush was over and people had few ways of making money. There were three families who owned cars in Amphitheatre at this time, Spiers (who owned the two story house opposite the store) Tom Ennis who owned the store and ourselves, who owned the butcher shop. We bought a Hupmobile with a running board down each side, on which the older children would ride when we went on a picnic. Dad could manage when the car was going alright but hadn't a clue about what was under the bonnet. We were often stuck up in a road and would have to rely on Mr Fred Spiers (who was an expert on cars) to get us going again. We called him Uncle Fred and he always drove racing car types of cars. He had a Lancer on which the hood would go down and he was the envy of everyone, needless to say he was a bachelor, and rich. He always sat in the back of Church and fed us minties. The church, which is now closed, was Methodist, Presbyterian and Church of England by turn and my mother played for all services, the whole family used to go to church too. The Presbyterian minister was Mr. Robinson. He was old with a white moustache and he was unmarried.. He used to delight in giving Joy and I a hug and a squeeze and we hated it. He drove a horse and buggy out from Avoca and Mum would feel duty bound to give him a meal, we always tried to steer clear and keep our distance. At Amphitheatre we had a maid and a washer woman, who also did the ironing. The washer woman was Mrs. Rayner and the maid was Nellie Barker and later her sister, Bubs Barker. When we moved to the farm (Thetford) we had Lillian Ross and then Daisy Ross (both sisters of Mrs Wes Dawson). When they were married we had Annie Allan to do our washing, she would ride her bicycle from Lamplough (and later married Pat Turpin, Alison Wardlaw's uncle, when in their fifties; Annie had to wait until her mother died before she married). We then had a string of maids from Amphitheatre, the Collins sisters, Amy, Ms (who married George Latch) Jessie (who married Ken Rayner) and the youngest sister, Annie. As each one got married the next one stepped in. If any of us were ill we had the Bush Nurse, who later became a friend of the family. Her name was Alice Gore, she later married a farmer from Elmhurst, Jim Potter. They were quite well off and having no children of their own often had Joy and I to stay in the school holidays. Auntie Alice had a walk in pantry and when we went to her place she would always have the shelves lined with the most delectable food. They had a pet cockatoo that was like a child to them. It would say "Cocky wants a hot spud". Joy went to Clarendon College while Elvie was still there. By this time Errol had finished at Scotch College and was home working on the farm. By the time I began at Clarendon College the older three had left school but Joy was still there. By this time the depression had started and I wonder now however Dad managed to keep us there. My mother was always ill and had endless operations having to spend long periods in St. Andrews Hospital in Melbourne. She had no tonsils, gall bladder, appendix and only one kidney. She had quite a lot of bone removed from each side of her head to relieve the pressure of the shocking migraines she got regularly. She still lived to be in her seventies so she must have had a strong constitution. I studied music at college and carried on with my studies for some years, obtaining my A.L.M.C., L.L.C.M., and T.D.L.C.M. . I commenced teaching when I was eighteen, riding my bike out to Amphitheatre where I first went to different houses and when I got more pupils I taught in the Amphitheatre hall. When I was 21 my father passed away in his sleep, my very first contact with death and what a dreadful shock it was for us. My mother moved into Avoca into a house in Faraday Street (third house from the corner of the Ararat road, towards the football ground). When I married, Allison Turpin came to work for my mother and stayed with her for some years until she married Sam Wardlaw. My parents had purchased the farm adjoining our property along the river for Errol who had married Elma Brown from Avoca. It was called 'Argyle' and had been owned by a Scotchman, John Campbell and his two spinster sisters, Flo and Mary. Errol and Elm had two sons and a daughter, who was brilliant. When the boys were old enough to leave in charge Errol and Elm spent all their winters up in Hervey Bay in Queensland. Errol went fishing and collected opals and fossilized wood, coloured sand and agate stones which he cut and polished when he got home. Elm played golf and taught hundreds of children from the inland to swim when they came to the coast. She also took swimming classes at the Avoca pool until she was nearly 80 (she taught all her children, nieces and nephews to swim in the Avoca River before the pool was built). Dad's sister Jean died of a ruptured spleen early in life. My mother always said that she was a lovely girl. Grace married Jack Lusby (who worked for my father until he married Grace) and they bought Lew's farm up at Glenlogie. Grace, who loved children, was apparently unable to have any of her own so hung herself in the garage when in her early forties. Later Jack married Dos (from Maryborough) and they had only son, John (who married Isobel Anderson and they had three children, Rodney, Suzanne and Raylene). While 'Thetford' was being done up to my mother's satisfaction Mum took Joy and I over to Tasmania to stay with her mother. I will never forget the trip through the rip. The three of us were violently ill, both going over and coming back. I was a plain, fat, sooky child and I can remember howling when I was put to bed over at Grandma's. Poor Joy, what she had to put up with. My mother would play the piano for what seemed like hours and the others would all gather around the piano for a sing-a-long, so they couldn't hear me howling. In those days mere was no bus running from Amphitheatre to Maryborough and as both Errol and Elvie were attending High School in Maryborough they had to board in Maryborough with Elvie's music teacher. Later Errol went to Scotch College in Melbourne and Elvie went to Clarendon College in Ballarat where she continued to study the piano and later took pupils. She was no scholar but was good with her music. She married George Bird from Glenlogje and lived in Amphitheatre, they had three children Ian, Noel and Jeanette. She was a wonderful cook and used to cater for various events around Amphitheatre. She also, almost single handedly, decorated the Amphitheatre hall for the debutante balls that were held there each year, making hundreds of paper flowers and arranging them beautifully. She didn't keep very good health and died of heart disease when she was 62. Errol was an excellent sportsman winning prizes in high jump and running, he also rowed in the Scotch College rowing team in the 'Head of the River*. He was also very academic and became Dux of the school in his last year there. When he came home he played football for Avoca beginning in 1927, he was first appointed captain at the age of 22 then again in 1933,34,35 &36, when he was also coach, 1935 being a premiership year. In 1937, aged 29, he was appointed captain/coach of the Pyrenees side as well as playing in the Avoca premiership side. He has been named as one of the clubs all time great players. My second brother Trevor (6 feet tall) had years of trouble with a crippling leg complaint (fluid on the knee). He attended Ballarat College and though no scholar he was a wonderful horseman. He had a large chestnut stallion named Stanley Bruce (Brace for short) after one of the politicians of the day. He could jump anything with Trev. on his back. Errol came home from Scotch with lots of big ideas. He had studied agriculture, and of course wanted all big new machinery - all horse drawn of course. We always had good draught horses which it was Trev's job to feed and groom. Errol had a wicked looking palomino stallion for his mount. The horse was inclined to be vicious and my parents were always worried about Errol riding him. In those days they had wonderful processions of coloured floats and horses, and when the band music started up Errol's horse usually played up, standing on his hind legs, but Errol could handle him; no-one else rode him. Joy and I also had a large horse called Brownie. We learned to ride at quite an early age. My mother drove a pair of ponies called Nipper and Pipper in quite a flash buggy. She always looked beautifully groomed and turned out. Nance's further recollections of meeting Howard Chapman and her war years, together with a press clipping of her award (2005) as a "Pyrenees Treasure", are at Appendix 15. My parents, George and Elvie (nee Howell) Bird married in 1935. They rented and lived at Thetford during the later war years (1942-45). I have clear memories of those years and began school from there. Trevor took over the homestead and property after he returned from war service. He married Edna Wardlaw and raised three children: Terry, George and Judy. In 1949 the Central Victorian Dredging Company, a 'no-liability' gold mining company, took over much of the Howell family farming property in the Avoca River valley, for open-cut bucket dredging and for settlement ponds. The company used 'miners rights' to compulsory acquire some of the best farm land in the district. It was a disaster for the Howell farming operation which ended only when the dredge sank in 1957. The mining company had originally contracted to restore the land, however it was bankrupt in 1957, and enjoying no-liability status, simply walked away from the incredible mess it had created. There still remains massive evidence of this destructive dredging operation on the property. Life was very difficult for farmers after the war and exacerbated for Trevor by the gold dredging operation on much of his farmland. He became very depressed over financial issues and took his own life in 1952. This was a very hard and sad time for us all; he left a very young family (Judy was a baby). Edna married Vern Neil in the late 1950's; they continued to operate the property and live at Thetford. Trevor's eldest son, Terry and wife Rhonda together with their family still occupy Thetford and farm much of the originalproperty. Errol's eldest son, Jon, wife Lyn, and their family operate other significant areas of the property and Errol's property, Argyle. By the 1880's the Howell brothers, William and Henry, were financially secure; they thrived in Australia. From humble and desperate beginnings in the Thetford Workhouse, they were now pillars of settler society in country Victoria and South Australia. George Pinch played a pivotal role in their success. William's children in Amphitheatre were well educated and played leading roles in business and community affairs. The plight of their mother Jane and sister Georgiana is unknown. Through this current family history research, several 'long-lost' Howell family descendants have reconnected and worked together to compile this historical record of the family. Although much careful effort has gone into the research many unanswered questions remain. Lack of documentation means much Howell family history has been lost forever. Perhaps painful memories of England and the voyage to Australia were deliberately forgotten and not passed on. There are virtually no historical records available from within the family such as diaries, letters etc. We are limited to public records and vague family memories. Jane Green and most probably Lew Offwood were the founding parents of our branch of the Howell family: not a drop of genuine Howell DNA amongst us all! It is now one hundred and fifty years since 15 year old William Howell arrived in Amphitheatre with George Pinch to begin a new life journey. Despite all the trials and tribulations over those many years, family members worked with a will and put down firm roots. They remain to this day prominent farming and community identities in the Amphitheatre-Avoca district. There was a general feeling of regret throughout Avoca and district when it became known that Cr. Geo. Howell had peacefully passed away in his sleep at his home on the night of Tuesday last. Mr Howell was son of Mr and Mrs Wm. Howell, pioneer residents and was 62 years of age at the time of his death. For a number of years Mr Howell carried on a butchering business at Amphitheatre but for some years past has been following farming pursuits. He was a successful farmer and his advice was freely sought on many farming problems. Of him it can be truly said that he was a thorough gentleman. He took an active interest in all matters that were for the betterment of the district. For many years he has been a councillor in West Riding of the Shire of Lexton and will be greatly missed by that body. His favourite pass-time was bowls and he was at the time of his passing president of the Avoca Bowling Club. A widow, two sons and three daughters are left to mourn his loss. Members of the family are Errol, Treveor, Nancy, Joyce and Mrs G Bird, all of whom have the sympathy of a large circle of friends. The funeral took place on Thursday afternoon, leaving his late residence at 3pm for the Glenlogie Cemetery. The funeral was a very lengthy one, bearing silent testimony to the esteem in which the deceased was held. The coffin bearers at the house and grave were members of the Lexton Shire Council viz. Crs. D Keith (President), W McCully, D Coutts, A Clark, H Broidy and J Flynn. Cr W H Kaye and Mr W M Oliver (Secretary) also represented the Lexton Shire Council. The pallbearers were Wor. Bro. G D Williams (Worshipful Master), Wo.. Bro. H J Chapman, Bro. M H Gyton (representing the Avoca Masonic Lodge), and Messrs John Mackereth, E Gollop and J Grant (Avoca Bowling Club). Rev. H J Saw (Presbyterian) conducted the service at the grave. The service of the Masonic Order was conducted by Bro. G D Williams (Worshipful Master) and Wor. Bro. E T Brown (Chaplain) of the Avoca Lodge. Mr H F Classen had charge of funeral arrangements. Before the business commenced councillors stood in silence with bowed heads as a mark of respect for the late Mr G P Howell. The Council then adjourned, and upon resumption only business of an urgent character was transacted. QUAYLE. - On the 14th March, at Amherst Hospital, after a three days' illness, Joseph William, beloved husband of Fannie Elvins Quayle, and son of Kathrina and the late Thomas Quayle, and brother of Catherine Tilley, Edwin Thomas Quayle, Clara A.E. Denney, and John Quayle, aged 42 years. The very latest in the quest to find Georgiana Howell.